During the latter part of the nineteenth century De La Rue produced two special packs of cards designed for the Continental market, although they would also have been available in the home market. 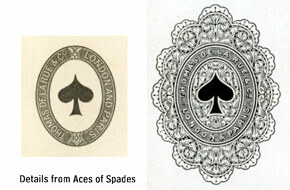 The Aces of Spades (right) are marked "De La Rue & Co. London and Paris" but with no mention of exportation tax or duty paid because at this time the duty was printed on the tax wrapper. The non-standard court cards were given a European feel along with fancy costumes and moustaches on the jacks. In addition the suit symbols were the more refined versions used on the Continent at that time. The backs of both packs are plain. Both these packs are rare to find today. Images by kind permission Barney Townshend. See also article by Michael Cooper: De La Rue & Co. London and Paris Decks, in The Playing-Card, Vol.34, No.1, Jul-Sept 2005, IPCS, London.